More than 60 experienced practitioners came together to produce this single-volume ready resource on every facet of construction law. In addition to review by the editorial board, every chapter was peer reviewed by another experienced practitioner. And, because owners and contractors often have differing perspectives, whenever possible peer reviewers were chosen to reflect the perspective that differed from the author’s. Like all WSBA deskbooks, this one is practice-oriented, with practice tips, drafting tips, comments, caveats, examples, and checklists set off throughout the text. For experienced practitioners in this area and for those who do not regularly address construction law issues, this is the guide to turn to when researching those issues under Washington law. This deskbook is also available online via annual subscription. 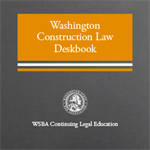 You may also subscribe to the "All-Publications" Library of WSBA Deskbooks and selected coursebooks online, as well as to seven individual practice area libraries of deskbooks and selected coursebooks online.